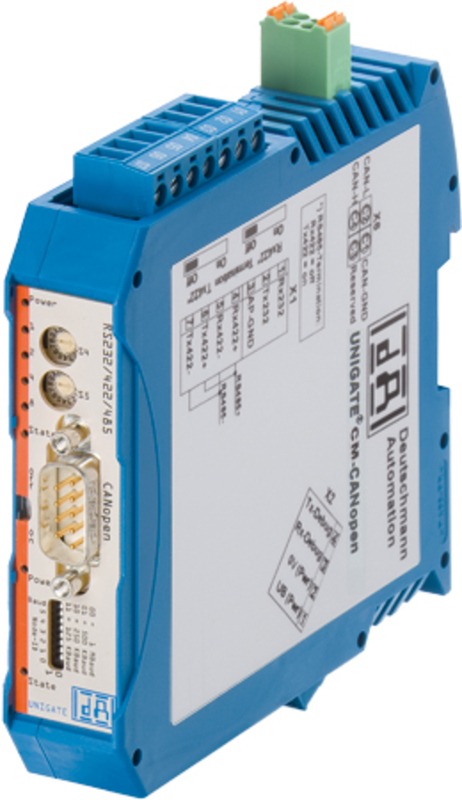 The UNIGATE CM Gateways connect CAN/CANopen-Participants to all Fieldbus- and Industrial Ethernet systems that are supported by Deutschmann. Besides RS232, RS485 and RS422 standard interfaces, the UNIGATE CM CANopen Gateway has an additional CAN/CANopen interface with Mini-Master functionality. Hence, the gateways can connect both CANopen networks and individual CANopen devices into higher-level networks. With the Deutschmann developed configuration software WINGATE, the reliable components can be quickly and easily configured and immediately be put into operation. Furthermore, the module can be very flexibly programmed with the Deutschmann developed script language.